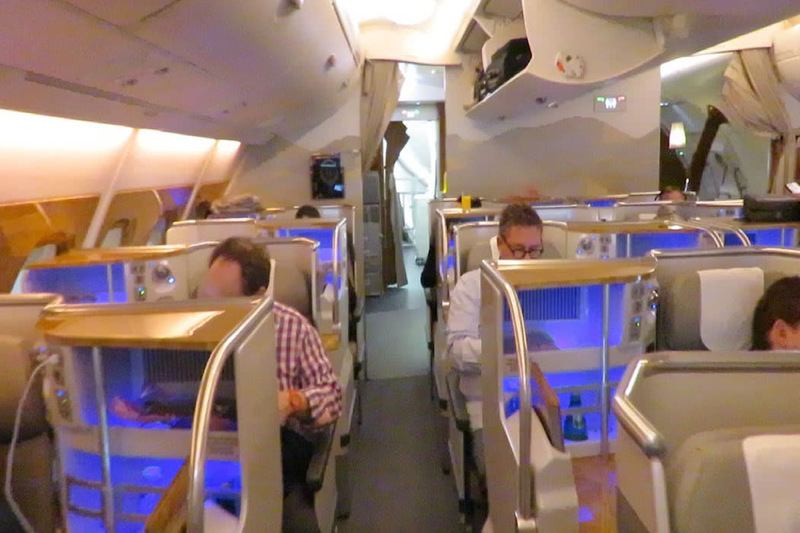 This article reviews my overnight flight on Emirates A380 in Business Class Düsseldorf To Dubai. 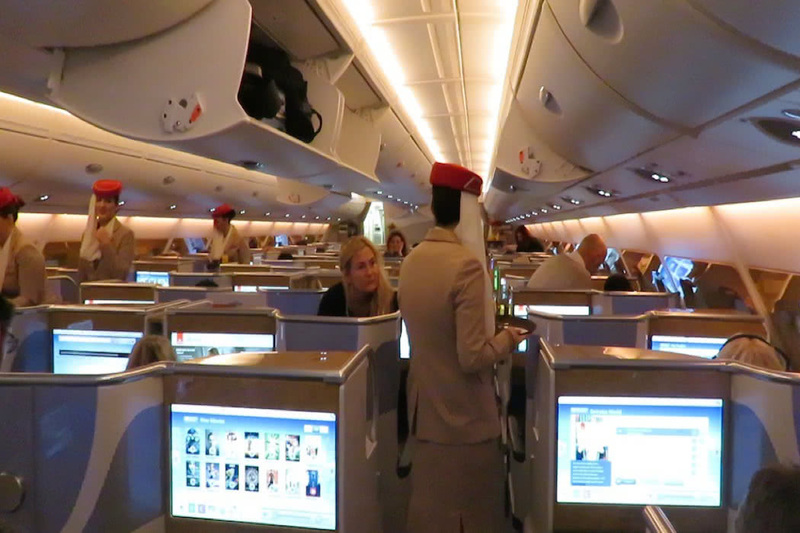 You can read my other reviews of Emirates in Business Class and Emirates First Class. The latter First product is rather good but the Emirates Business Class product falls short with seats that are too narrow for a good nights sleep. This flight was booked as part of a mileage run which is either a result of being a frequent flyer genius or completely insane. 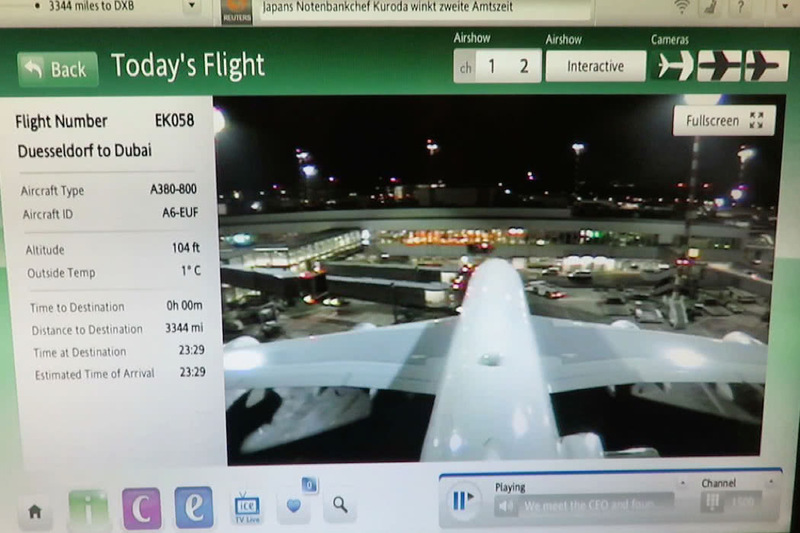 The run was n Emirates A380 in Business Class Düsseldorf To Dubai and then back. The aim was to earn miles and to get top elite status with Emirates frequent flyer program Skywards. This bonkers drip was booked because of a pricing error and an unusually low Business Class fare which was just 750 euros per person. This crazy and exhausting adventure resulted in just 3 hours in Dubai before returning to Düsseldorf 16 hours after leaving. The result Emirates Gold Member status but sitting in an aluminium tube for hours with no destination is not only a waste of time but is also not good for one’s health. It is not a trip I recommend or one that I will be repeating! Emirates operates two versions of its A380 aircraft. The most common A380 version offers 489 seats in a three-class cabin configuration with 14 private suites in First Class, 76 flat-bed seats in Business Class and 399 spacious seats in Economy Class. Emirates also operates some two-class configured A380s, which feature 58 flatbed seats in Business Class and 557 seats in Economy Class, taking the total to an impressive 615 passenger seats. Currently, the two-class configured A380 flies to four destinations including Bangkok, Copenhagen, Manchester and Kuala Lumpur. The flights to/from Düsseldorf are operated by three-class configured A380s (although the airline seasonally swaps the A380 to the B777 on this route). All of Emirates’ Business Class seats are located in two cabins on the upper deck of the Airbus A380, behind the First Class cabin. The first cabin contains the bulk of the seats (58 in total, spread over 14 rows), while the cabin located at the rear of the plane feels more intimate as it only comprises 18 seats in 4 rows. The Business Class seats are arranged in a staggered 1–2–1 layout, providing each passenger direct aisle access and privacy. The Emirates Business Class cabin features lots of burled walnut veneer, gold trim and pearlised plastic, that frames the seats, windows and entertainment screens. Slightly gaudy but not unpleasant. All Business Class seats onboard the Emirates A380 are 18,5 inch (47 cm) wide. This is only slightly wider than the Emirates A380 Economy Class seats, which have a width of 17,5 inch (45 cm). This means that the Emirates A380 Business Class seats are too narrow, especially in the lie flat position. The pitch and bed length varies from seat to seat: aisle seats (B, D, G, J) are slightly shorter when fully flat, extending to 70 inches (178 cm) as compared to 79 inches (200 cm) for window and central seats (A, E, F, K). Seat pitch varies from 48 to 39 inches (122 to 99 cm), with the centre and window seats again offering more space as compared to aisle seats. Each seat comes with a touchscreen tablet (for the seat position & lighting controls, as well as the controls for the inflight entertainment) and a console on the side. The latter holds a personal minibar, stocked with soft drinks and juices, a universal power supply, a USB port, a reading light and another handset for the in-flight entertainment on the side. The fold-out tray table is hidden in the arm rest below the console. In front of each seat is a large 17-inch entertainment touchscreen with a generously sized ottoman below. 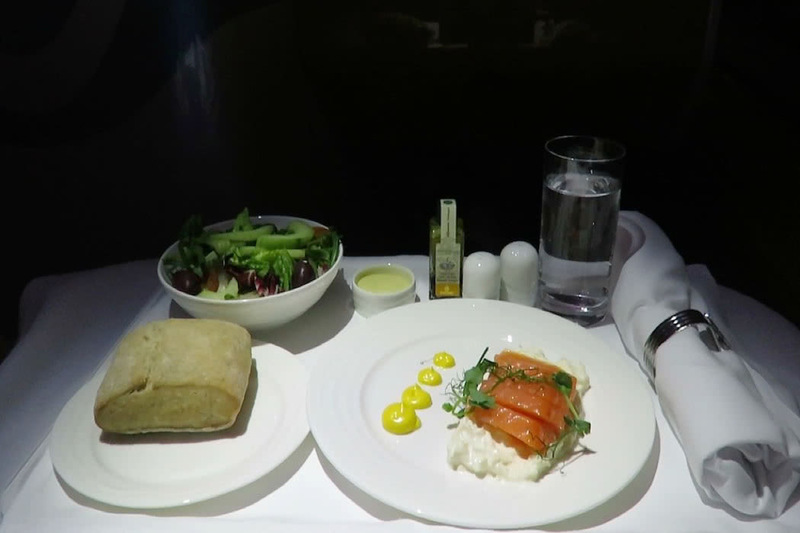 What are the best Business Class seats on Emirates’ A380? Solo travellers should choose one of the window seats A or K, since these are more private than the aisle seats (B, D, G, J) as they are sheltered from the aisle by the seat’s mini-bar cabinet and the enclosed footrest of the person behind. The centre seats E and F also feature their consoles on the aisle side, and when you don’t deploy the privacy screens, these seats can be transformed into an intimate mini-suite accommodating two passengers. Seats A and K on row 23 are the best Business Class seats on the A380 since they offer more legroom (a larger ottoman and longer flat bed) as compared to other window seats. 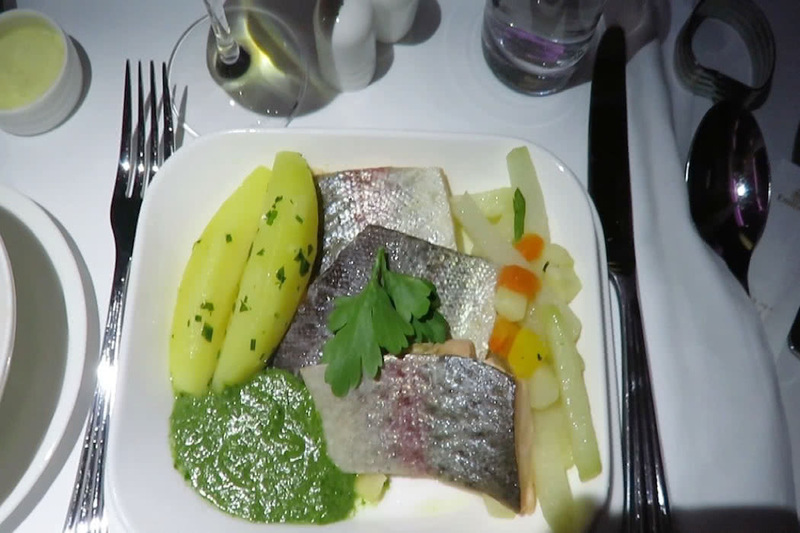 What are the worst Business Class seats on Emirates’ A380? The window seats B and J as well as the centre seats D and G have their console on the opposite side of the aisle, and can feel quite exposed. If you are travelling as a couple, you should avoid the centre seats D and G since these seats feature two consoles in between them, making it almost impossible to communicate with your partner in flight. If you are travelling solo, you should avoid the centre seats E and F, otherwise, you may end up next to a stranger in a minisuite, although you can always rise a divider for privacy. Seats 7A & 7K look to be the worst seats: despite the fact that they have extra legroom (similar to seats 23A & 23K), they are totally exposed to the aisle and do not offer any privacy. 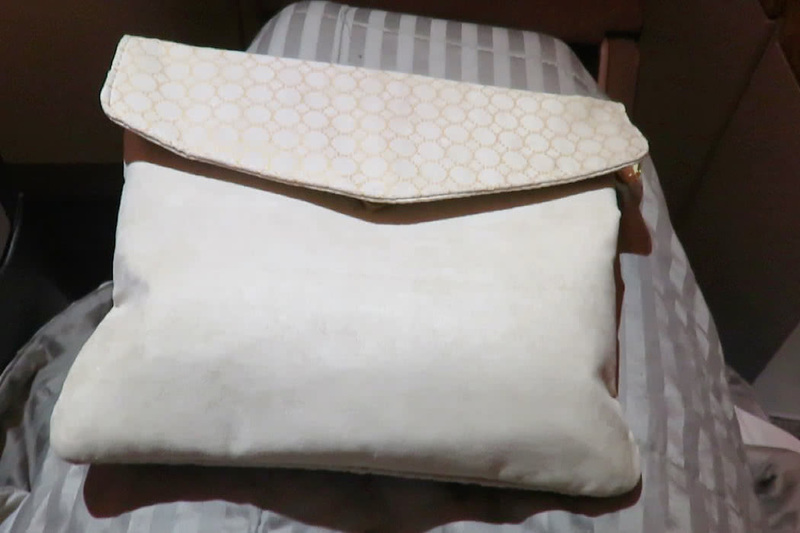 Business Class passengers get an amenity kit during night flights (not day flights). the Emirates Business Class amenity kit is one of the best in the skies, with a different kit for men and women. The men’s amenity kit is presented as a toiletry bag, with toothbrush and toothpaste and so forth, Gilette shaving foam and a razor, as well as moisturizers and aftershaves by Bvlgari. The women’s amenity kit is presented as a stylish Faux suede beige by Bulgari labelled washbag, containing flight socks, eyeshade and earplugs and ladies bits. 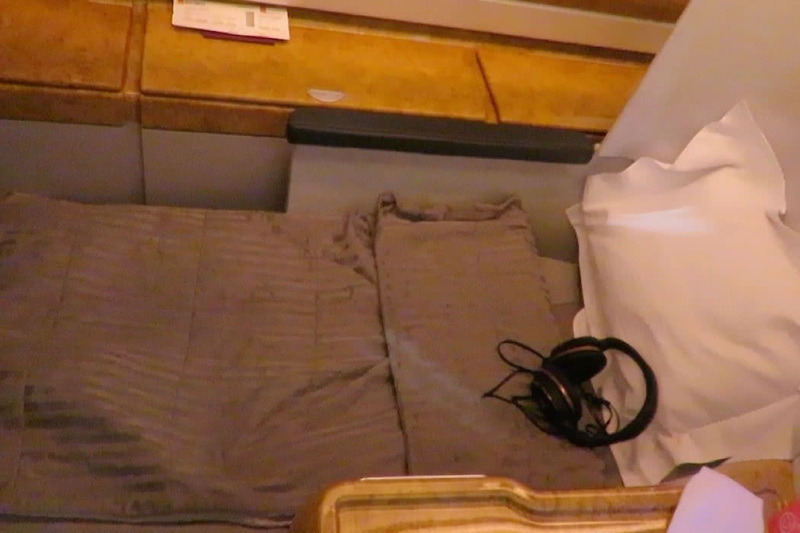 You also get a light blanket, a nice pillow, a duvet, noise cancelling headphones (you cant keep these). You don’t get pyjamas in Emirates Business Class. Emirates entertainment package is excellent. You can choose from up to 1,800 channels of the latest and greatest movies and must-see TV shows, on demand and in multiple languages. You can also listen to music or play our range of games. The cameras installed in the tail, nose and belly of the megaplane also offer some fun moments, especially at take-off and landing. The in-flight entertainment is displayed on a 17-inch touch-screen. Emirates also offers 10MB of free WiFi to each passenger during one of its flight (regardless of the class you are seated in). An additional 600MB can be purchased for $1 USD. If you exceeded that limit, you can purchase another 600MB for $1 USD. The quality of the WiFi connection during the flight was variable. At the rear of the upper cabin, you find the A380 onboard lounge which is a bar exclusive to First Class and Business Class customers. Here, you can choose from premium spirits, exclusive wines, champagne, cocktails and beers alongside hot and cold beverages served by a dedicated bartender. If you fly Business (or First) class with Emirates you get complimentary chauffeur-driven airport transfers. Chauffeur-drive must be requested online, up to 48 hours prior to your flight. If you are inspired to fly away, you should always check with our Luxury Travel Concierge before booking to get further discounts and free upgrades on luxury hotels and Business Class flights.